Jonathan Thon recently had the opportunity to participate in a working group that reviewed the National Institutes of Health’s foray into translational research funding. Science is international. In September I had the pleasure to be one of a handful of researchers invited to participate in the National Heart, Lung, and Blood Institute’s working group on early translational research needs in blood science. The structure of the meeting was simple: after a short introduction each of us were invited to present a 25-minute overview of our translational research programs, followed by a 20-minute review of the National Institutes of Health’s foray into translational research funding. The scope was open-ended and at the end the group had the opportunity to discuss common themes that emerged from our individual recommendations. The approach is not just relevant to our discussions on The Black Hole, but also has farther reaching consequences than just the NHLBI or NIH. It’s worth paying notice. For discussion purposes, early translational research was defined as technology development across the spectrum of activities happening between fundamental discovery research and human trials. Figures c/o Traci Mondoro, Ph.D., Chief, Translational Blood Science and Resource Branch (NIH/NHLBI). The NHLBI has been reading our posts, and it’s clear that they are listening. The goal is to move away from their current state, which is siloed and difficult to navigate (much like our own funding agencies in Canada), to a future state that re-imagines the process of translational research as a funnel (see below). 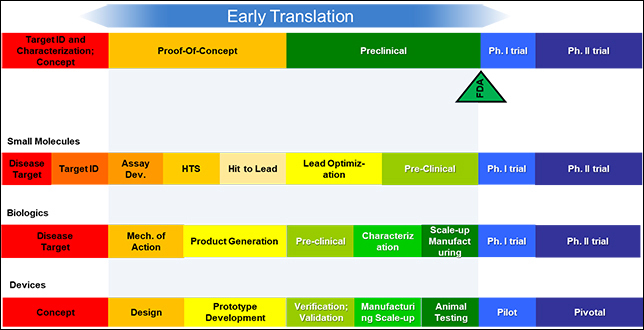 In this new model, more numerous projects exist at the pre/proof-of-concept stage, and are gradually consolidated or fail to advance as they progress through the preclinical phase to regulatory approval. This “new” model envisions that not all projects will succeed, nor should they, but enables the NHLBI to be able to continue to support those projects that do until the point where they can be picked up by other major funding bodies, including private investment. It does not pick winners, but does double down on projects that clear major hurdles, at the expense of those that don’t. My next post will describe the structure of the NHLBI’s working group on early translational research needs in blood science, and summarize its recommendations. Post 3 on this topic will describe our further recommendations to the working group, and the role Dave and I believe the federal funding agencies should play in the future translational research in the sciences.